1. Weird cravings. Well, maybe not so weird – but thankfully I wasn’t pregnant as that would not be a healthy child! Typically a health nut, I gravitated towards the consumption of good tequila, wine and whiskey, gallons of coffee, pounds of dark chocolate. To TRY to balance it out, I ate tons of kale, garlicky guacamole, dandelion tinctures, and pot after pot of herbal tea. 2. Weight gain. I will call this “music-baby weight.” See above. Duluth, Minnesota in the winter doesn’t help. 3. Strange dreams. Both waking and sleeping, my visions were wild. Dreams of isolation and running away. Dreams of sharks and snakes and old lovers and weird landscapes. Dreams of escaping the self-imposed deadlines and drinking tonics of spring flowers with beautiful fairy maidens. No lie. 4. Exhaustion. I cut back on work by quitting my day job when I wanted to focus on the album in the fall of last year. But I found that once I put more energy into the creative work and making sure the album was going to have a proper + epically fantastic “birth,” it took more work than all my other day jobs ever did because I could never stop, never just relax or leave it be because this is my BABY! And so, I was sleep deprived. 5. Enlisting the help of creative midwives, doulas and support systems. I employed an expert team to help birth this creative baby. Musician + band family support around the “microphone bedside” / or recording “birth pool” (depends how hippie you are), recording engineers with years of mastery like that of skilled midwives or OBGYNs, the gatekeepers of publicity to announce the birth, the public response of music critics, the birthday parties and now the “nursing,” exercising off the baby weight, trying to keep the thing alive. This is yet another challenge – how to keep this music baby healthy and happy and THRIVING???!!!! 6. The public opinion of the new baby. You’ve heard that saying, “A face only a mother could love.” Whenever you put something out there, someone’s gonna love it, or judge it, or be mean, or indifferent. Art is like this, life is like this. There is no separation. To exist is to come into contact with the world. Scrapes, bruises, heart flutters, joy, bliss, despair, anxiety – all kit and caboodle to being alive. A well-known music critic (Chris Riemenschneider from the Minneapolis Star Tribune) said this of the album “Bue’s dark and sometimes warped batch of songs are themselves quite ugly and unholy …” He thankfully ended his review by calling it “highly recommended” – but even while a baby is beautiful and stunning in your eyes, someone might call it “warped.” I will take pride in this – heh heh! 7. Impregnation! Let’s be real – where do babies come from???!!!! From love or “whoops,” hopefully there was a good time involved at inception. These songs come from the heart, infatuation, obsessions, monkey-minded love affairs with words, and more than a few long nights. We can be scientific to describe birth, the meeting of inspiration and manifestation, sperm and egg. But the collection of cells, sounds, moments, memories and experiences that make up a baby is ever shifting. While this album differs in that it won’t change, every time you listen to an album, YOU are a different person and so it does change. It captures a moment, a meeting of the minds, community and collective talents. Where do the words come from? Where does a tune come from? I leave that miracle to the cosmos, to the collaboration of neurons and synapse as well of memory in my warped, weary, music-mama-mind. 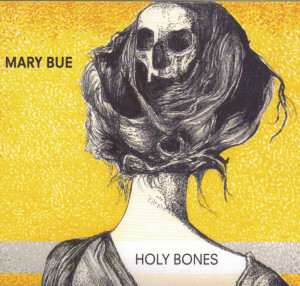 Happy birthday, Holy Bones. I’m so glad you were born.